Worldpeacefull presents to you a great possibility for you can change the world for children and children will change the world for you. This is the moment for children to SPEAK UP and create the world they would like to see. The Climate Change Conference has ended and now is the time to implement projects that will engage young people, as they will be the change as it is their future that will be affected by climate change and wars over resources. This Award will inspire young people to focus on peace and sustainability. The two are intrinsically linked, we cannot sustain the planet without peace and goodwill. Peace and Sustainability is the Number One issue of our time and it is a critical moment for the future of humanity. It is time to SPEAK UP and be the change we wish to see. I am seeking innovative and inspiring project partners to support and collaborate to establish the SPEAK UP Award for the benefit of children across the world. I am searching for a principled leader to get behind this initiative. It is proposed that an International Sustainability & Peace Encouragement Award for Kids to Unite People (International SPEAK UP Award) be established. The International SPEAK UP Award will have as its call to action ‘to be the change you wish to see in the world’ (Gandhi). This is a powerful message that leads by example and encourages ethical conduct and real-world community service. This is an important message for children and world citizens around the World. The purpose of the International SPEAK UP Award is to empower the next generation to lead the collective visions and actions for peace between people and with natural systems. The Award empowers children by rewarding and acknowledging their ideas, creativity and capabilities in peace building and ecological sustainability in their local communities. The Intern ational SPEAK UP Award raises awareness of the critical importance of children, as future stewards, to be actively empowered in peace building and ecological sustainability in alignment with The United Nations Agenda 21 which advocates to ‘think globally and act locally’ to unite people in their local community and inspire the world. It is proposed that a reputable international organisation become the lead organisation and the sponsor of the International SPEAK UP Award. Significantly, the international organisation chosen will be in concert with a growing worldwide movement empowering a real future for children inspired by the theme ‘to be the change you wish to see in the world’ (Gandhi) and inspiring world citizens towards self-responsibility, peace as personal change and to action peace and sustainability in their world. It is proposed that the International SPEAK UP Award be promoted worldwide to schools and submissions collected at the local level. 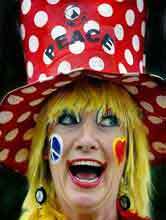 Susan Carew, a Peace Scholar, will travel to nominated countries as Peacefull the World Peace Sustainability Clown. Starting an adventure to inspire the world. Susan Carew is a trained market analyst and will conduct market research with school children. The research is entitled Children’s 2050 Visions. The research will provide an opportunity for children to voice their ideas on what peace and sustainability means to them and the world they envisage. Moreover, it will provide important global data and provide alternative visions for the future. A documentary film will be produced about the International SPEAK UP Award. The film will trace the journey, highlighting the highs and lows and the many hands linking together in selfless ways. Interviews will be conducted with principals, teachers, children, parents, communities and interesting individuals met along the way revealing their impressions and what they are learning about peace and sustainability. The documentary film enables the voice of children to be heard, promoting how children envisage peace and sustainability and how children express how they can make a difference in harmony with Gandhi’s vision ‘to be the change you wish to see in the world’. Children will realise that when they change this changes their world locally and globally. It is proposed that a Patron be nominated, this person will be an outstanding individual demonstrating a lifelong commitment to youth, peace and humanity. This person will inspire others with the vision of empowering young people to become involved in peace building and sustainability projects across the world. It is envisaged that the International SPEAK UP Award recipients and outcomes be presented to the United Nations. The recipients will be children and youth of outstanding values and merit demonstrating a determination to be the change they wish to see in their local communities. Thus thinking globally and acting locally. The author of the International SPEAK UP Award is Susan Carew, a Peace Scholar based in Australia. In 2010, I travelled the world as a World Peace Clown to 20 countries in 6 months. I self funded the project to go to schools, hospitals and clowned on the streets to bring peace to life as love and joy and to test how the clown was received cross-culturally. What I require is like minded empowered people who can commit to an idea and follow through. I have already shown through my work that I have the capacity to carry this project out. If you are inspired about the future and an ethical person/organisation then please connect. Dear Susan, thank you for sending me the advance copy of your interesting proposal for a Rotary International Peace Award for the Children of the World – a very commendable concept. Dear Susan, congratulations for taking on this very ambitious project/journey/quest. Dear Susan, I really admire your noble effort to educate and inspire children, particularly to understand peaceful philosophy and also the education that you have given yourself in this area. Dear Susan, Kris here – I have read you proposal and I think it is admirable and a great initiative. Dear Susan, the wonderful aspect about you is that you are still pursuing your dreaming and I think that is terrific. I really hope you succeed in this endeavour. Overall it seems good. I confess to fluctuating between cynicism (big international organisation, bureaucrat-speak) and enthusiasm (yes, excellent idea, could become an inspiring and empowering process). Going through Rotary I think is much better than the UN, much more likely to actually achieve something. Overall, you won me over. As an intergenerational concept, sustainable development requires present generations to nurture the world’s social, economic and environmental well-being, and to enable next generations to do the same. The transfer of critical knowledge to today’s young people is vital, yet its realization is threatened by crises in resource-stressed regions and by diseases threatening to obliterate whole generations. At present, youth under the age of 25 comprise over 50 per cent of the world’s population. This scenario calls for significantly more attention to be paid to preparing youth for the challenges ahead. Many solutions have been proposed to bring young people to the forefront of sustainable development practices and policies, but without sufficient response from national-level policy-makers, young people can become marginalized in the political sphere, left with the impression that their input is not valued. The UN General Assembly’s Special Session on Children in May 2002 attracted 69 Summit level participants and 190 high level national delegates. The session included political leaders, UN agencies, religions, business, arts, academia and civil society. Five Nobel Peace Prize Laureates attended and 1,700 delegates representing NGO’s from 117 countries. For the first time in the history of the UN meetings, more than 400 children were there as delegates and active participants. The UN Secretary General told delegates that ‘the children in this room are witnesses to our words”. The children were more than that as they challenged the adults, informed them and provided stories of their lives. The children inspired all present with their belief in collective change and their hope. Governments at various levels should promote and support programmes and campaigns to educate the public and parents on child rights generally and in particular on maintaining positive, non-violent relationships with children in families. Here, the media can also play a key role. The 1959 Universal Declaration of Human Rights sets a universal standard on the rights of children. The declaration highlights the need for children to develop individual abilities and learn to be useful members of society, protected from harm and exploitation. Moreover, the responsibility of parents and others is to provide conditions that will foster the development of children, enhance confidence and self esteem enabling them to develop to maximum potential. The United Nations (UNESCO) designated the Decade 2005-2014 to be dedicated to Education for Sustainable Development. This decade overlaps with the Decade for a Culture of Peace but each decade is not mutually exclusive but must be communicated interchangeably. Governments from around the world have been invited to strengthen their contribution to sustainability through a focus on education. A culture of peace and ecological sustainability is intrinsically linked by universal values of learning to live peacefully together and taking responsibility for ecological sustainability over unabated materialism, consumerism and self interest. It is essential that a balance is achieved and a goodness of fit is attained. UNESCO APNEIVE [Asian Pacific Network for International Education and Values Education] provides a circular diagram to highlight the balance. It is vital for the future of humanity that children are included, inspired, challenged and empowered to lead a culture of peace that is sustainable. To fail to act now will render the next generation without necessary tools and values for real hope. An International Peace & Sustainability Award is essential! !